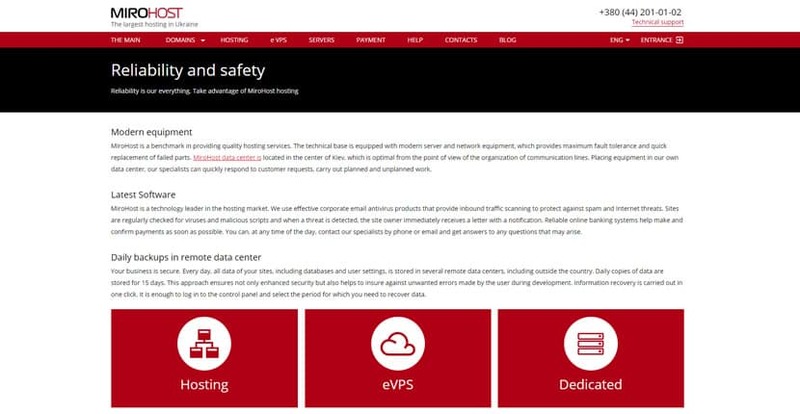 MiroHost Review 2019: Is MiroHost a Good Hosting? Founded in 2001, MiroHost is a large Ukrainian web hosting solutions provider with a sizable chunk of the market share in their native country. MiroHost focuses on providing quality web hosting services to rapidly-growing Ukrainian businesses and large corporations. MiroHost is one of the largest web hosting providers in Ukraine. In fact, they’re the second largest web hosting company in Ukraine by market share. They began their operations in 2001 and today have over 250,000 customers. While most of MiroHost’s customers are businesses in Ukraine, the company also serves clients in Turkey, Russia, Germany, and Poland. The MiroHost website is available in Ukrainian, Russian, and English. As one of the largest hosting providers in Ukraine, MiroHost focuses on providing web hosting services to medium-sized businesses and large corporations. They also have lightweight shared hosting plans for startups and small businesses, but it’s clear that this isn’t their target market. These are definitely adequate to get you started, but you may find in the long run that these plans are rather limiting. They don’t include SSL certificates, for instance, so your search engine rankings will take a hit and you won’t be able to run any e-commerce websites on the base plan. Furthermore, storage for all three shared hosting plans will feel restrictive to media-heavy websites: you get 3GB, 6GB, and 9GB for their Mini, Site, and Portal plans respectively. The MiroHost data center occupies over 230 square meters and can host up to 10,000 units. It also has three backup diesel generators with enough fuel to keep the data center running for up to 30 hours. I should note that there’s one caveat with MiroHost’s control panel. It appears user-friendly and quite decent, but a closer look reveals a different picture. For instance, a simple task like creating several mailboxes and adding a mail subdomain is unnecessarily tedious. Most of the actions users will undertake are repetitive, with no way of completing the task in one smooth and simple process. MiroHost’s plans are reasonably priced, though of course you should expect to pay more given that their specialty is in virtual and dedicated servers. All prices indicated are in Ukrainian hryvnia. MiroHost allows you to test out their virtual servers for up to 30 days. This is a rare perk for a VPS provider, given that many other companies won’t even give you a money back guarantee. MiroHost has made available several methods through which their customers can get in touch with their support staff. These include the contact form on their website, email, a support phone number, and a fax number. They don’t have a ticketing system or a live chat, unfortunately. This is quite surprising for a web host of their caliber. Also, perhaps because of MiroHost’s decision to focus on medium-sized businesses and large corporations, many of their smaller customers often feel neglected. My experience with this vendor mirrors those sentiments. It took over 24 hours for this vendor to respond to my queries. The support team was not entirely helpful, instead directing me to their knowledge base, which is only partly available in English. Most of it is written in Ukrainian and Russian. MiroHost is a good web hosting vendor for medium-sized and large businesses in Ukraine and the surrounding countries. However, small enterprises might want to look elsewhere for better customer support. Wondering how MiroHost stacks up against other Web Hosting companies? Enter any other Web Hosting company and we will give you a side-by-side comparison.